This worksheet is to be used in the context of human rights. After lead-in with vocabulary introduction, pupils watch the video "Heal the world"(link on the worksheet) and tick the rights which appear as violated on the video. Then, they fill in the gaps with the missing words as a listening comprehension exercise. 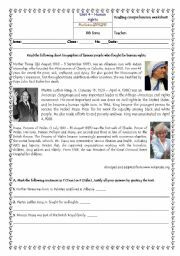 This worksheet was used in the context of the topic "Human rights" to explore the lives of some human rights icons after watching the video "Heal the world" where this people appear: http://www.youtube.com/watch?v=Jpz5eD9L4dA&feature=related. 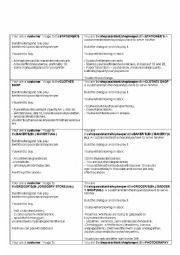 I´m using this worksheet in the context of the topic "Human rights", in particular "Children´s rights-child abuse". This is a true story of a Pakistaki boy who suffered great child abuse in many aspects. You can start by introducing different kinds of child abuse and then this worksheet. Enjoy! 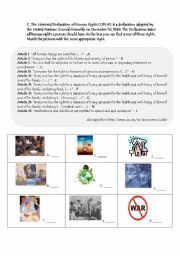 This is a worksheet to be used in the context of the topic "Human rights". Some rights were taken from the Universal Declaration of Human Rights and pupils have to match them with the pictures below. 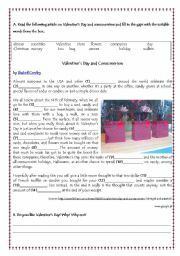 This worksheet is meant to raise students´ awareness for the negative side of Valentine´s Day as a "trap" for people to consume. Approaching Valentine´s Day in a different way also avoids stereotyped views and certainly makes students who don´t have a valentine happier! To warm-up I suggest brainstorming good and bad things about the holiday. Role-play cards to use oral shopping language in 6 different shops: stationer´s, clothes shop, baker´s, grocer´s, photography shop and newsagent´s. Hope you find it useful. 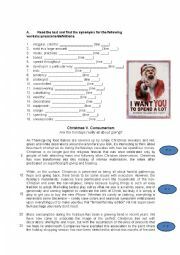 Here´s a reading worksheet on overconsumption at Christmas. To warm-up for the text I will use some cartoons. Then, before I hand out the worksheet the students will be ordering the paragraphs of the text. 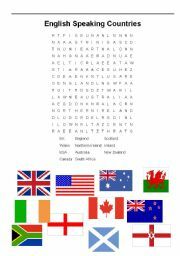 Good to stress the importance of all English speaking countries. 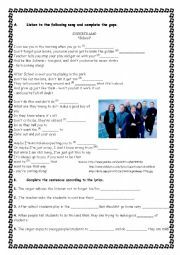 A reading comprehension and vocabulary worksheet. Can be used as a reading test. This PowerPoint game aims at consolidating/testing Autumn vocabulary in an interactive way with children. If you click the wrong word, it will disappear. The right word will complete the answer below. Enjoy! It´s a interactive and motivating activity to do with children. This PowerPoint presentation is intended to introduce inversion required by adverbs and other expressions at the beginning of a sentence. 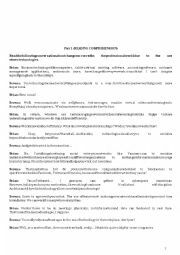 The examples are sentences created from the texts on pages 23 and 24 of the coursebook mentioned in the sources. It´s an interactive and motivating activity especially for young children who can´t read since the counting can be done orally. I prepared this presentation to use as warm-up/motivation to the short story "Seventh Grade" by Gary Soto. I included (inter)cultural aspects that also help understand the story. This PowerPoint is to used in the context of the short-story "Fruit Tree Island". You can use it to introduce Past Simple of irregular verbs and explain its rules. I have also posted a worksheet which can be used as follow-up activity.